A news story coming out of Alexandria, Egypt caught my attention this morning. 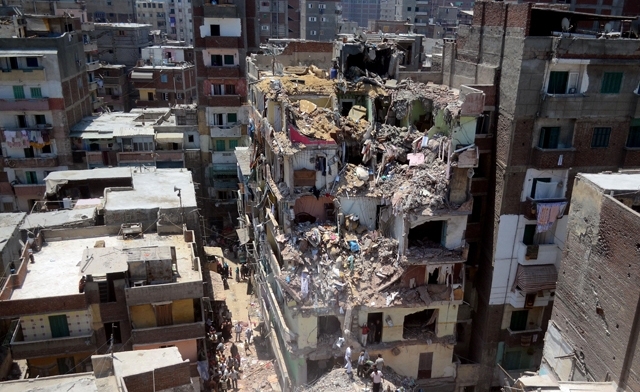 Looking into the tragic collapse of an eight-story apartment building, which comes rights on the heels of a devastating train derailment outside of Cairo, it’s apparent that this city’s problem of modern buildings abrubtly crumbling is epidemic. Alexandria, Egypt’s second largest metropolis, has seen several buildings spontaneously collapse in recent history. 2007 saw the fall of a twelve-story apartment building. The following year, yet another apartment building crumbled. In June 2012, two buildings were reported to have collapsed in the same week. The following month, an eleven-story building fell. A few months later, a three-story building. The country’s housing minister reports that 14,500 buildings have been built without license in the city. While shoddy construction and lack of building standards isn’t unique to just Alexandria (Egypt’s total number of unlicensed buildings is reported at 318,000), it’s remarkable to think of multistory residential buildings collapsing unannounced in such densely populated urban space–a seriously scary housing crisis.